Nomad wool is a small family-run business based in Turkey, the original home of Angora goat wool. We supply knitting yarns produced by methods unchanged for hundreds of years. 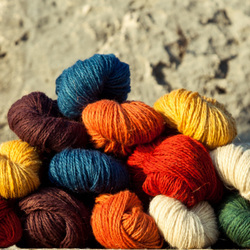 Our wools are sourced from a traditional village high on the Anatolian plateau. All our yarns are organic, hand-spun and hand-dyed or available undyed. 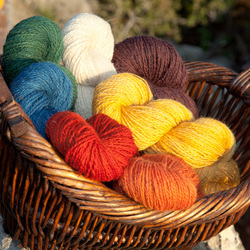 The natural dyes used are plant extracts, fixed to the yarn by the sap of the sutlegen plant. The bright colours reflect the history of these dyes, which were used to dye the exquisitely-patterned Turkish carpets that today sell for thousands in the bazaars of Istanbul. Our 100% pure natural sheep's wool yarns are hand-spun in villagers homes. They are double ply, available in a range of hand-dyed colours as well as undyed. Our mohair blends contain 30% original Angora goat wool for extra warmth, hand-spun together with 70% sheep's wool for strength. They are available in double ply and a range of hand-dyed colours, and also undyed.